KIEV, Ukraine -- Ukraine on Saturday rejected Russia's latest gas price hike and threatened to take its energy-rich neighbour to arbitration court over a dispute that could imperil deliveries to western Europe. Prime Minister Arseniy Yatsenyuk said Russia's two rate increases in three days were a form of "economic aggression" aimed at punishing Ukraine's new leaders for overthrowing a Moscow-backed regime last month. Russia's natural gas group Gazprom this week raised the price of Ukrainian gas by 81 percent -- to $485.50 (354.30 euros) from $268.50 for 1,000 cubic metres -- requiring the ex-Soviet state to pay the highest rate of any of its European clients. The decision threatens to further fan a furious diplomatic row between Moscow and the West that has left Kremlin insiders facing sanctions and more diplomatic isolation than at any stage since the 1989 fall of the Berlin Wall. "Political pressure is unacceptable. 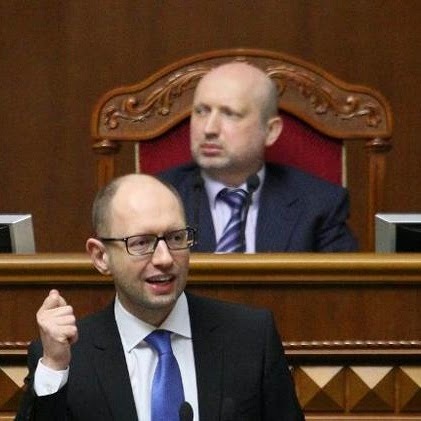 And we do not accept the price of $500 (per 1,000 cubic metres of gas)," Yatsenyuk told a cabinet meeting called to get a handle on the economic crisis that threatens to escalate tensions in the culturally splintered nation of 46 million. The profound scale of the rift between those who see their future tied to either Europe or the Kremlin was underscored when security agents announced the arrest of 15 men who allegedly planned to distribute 300 machineguns for the armed overthrow of the local government of a region neighbouring Russia. Ukraine's heavily Russified southeastern swaths have sought to stage their own independence referendums similar to the one that resulted in the Black Sea peninsula of Crimea being annexed by Moscow last month. Yatsenyuk said Ukraine must now prepare for the possibility that "Russia will either limit or halt deliveries of gas to Ukraine" in the coming weeks or months. Gazprom's European clients saw their deliveries limited in 2006 and 2009 when the gas giant -- long accused of raising the rates of neighbours who seek closer ties to the West -- halted Ukraine's shipments due to disagreements over price. The state gas company supplies about a third of EU nations' demand, despite efforts by Brussels to limit energy dependence on Russia over its crackdown on domestic dissent and increasingly militant foreign stance. Nearly 40 percent of that gas flows through Ukraine, while the remainder travels along the Nord Stream undersea pipeline to Germany and another link through Belarus and Poland. Ukrainian Energy Minister Yuriy Prodan said Kiev was ready to take Gazprom to arbitration court in Stockholm if Moscow refused to negotiate over a lower price. "If we fail to agree, we are going to go to arbitration court, as the current contract allows us to do," Prodan warned. But Gazprom countered that it was ready to defend any court action because it was simply reverting back to the price set in a 10-year contract that Ukraine had signed in 2009. This week's rate hikes reflected the elimination of two separate discounts that Moscow had extended to the government of ousted pro-Kremlin president Viktor Yanukovych. Ukraine's state gas company "has already been executing this contract," Gazprom spokesman Sergei Kuprianov told the Interfax news agency. "So from the standpoint of international trade practises, that means that it recognised (the 2009 contract)." The budding gas war adds another layer of concern to a crisis that has seen Russia mass tens of thousands of troops along Ukraine's eastern border and ignore Western pressure to cede its claim on Crimea -- rejected by both Kiev and the UN General Assembly. The Unites States has responded by boosting NATO's defence of eastern European nations and trying to isolate Russian President Vladimir Putin on the world stage. And both German Chancellor Angela Merkel and EU foreign policy chief Catherine Ashton said on Saturday that Europe -- once divided in the face of Putin's new expansionist streak -- was ready to impose broader economic sanctions against Russia if it pushed any harder against Ukraine. "If the territorial integrity of Ukraine continues to be violated, then we will have to introduce economic sanctions," said Merkel. "Might does not make right," she told a congress of her Christian Democratic Party. Ashton also said Europe was "prepared to take measures" against Russia. Yatsenyuk said he was busy trying to seal agreements with Ukraine's western neighbours on gas deliveries that would cost about $150 per thousand cubic metres less than Gazprom's price. Ukraine has already received small quantities from Poland and Hungary despite Russian disapproval. Yatsenyuk said he was also keen to secure an agreement with Slovakia, which receives all its gas from Russia and has been unwilling to complicate relations with Gazprom in the past. But Gazprom chief Alexei Miller responded by warning that Russia would be looking closely at any independent deals its client states reached with Ukraine. "European companies that are ready to provide reverse flow deliveries to Ukraine should take a very careful -- very careful -- look at the legitimacy of such sorts of operations," Miller told Russian state television.